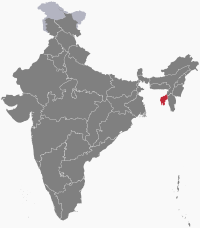 Tripura (Bengali: ত্রিপুরা) is a state in eastern India. It covers an area of 4,036 square miles (10,450 km2).It is the 3rd smallest state of India. It is bigger than Lebanon but smaller than Kosovo. This short article about Asia can be made longer. You can help Wikipedia by adding to it. This page was last changed on 21 January 2018, at 17:58.